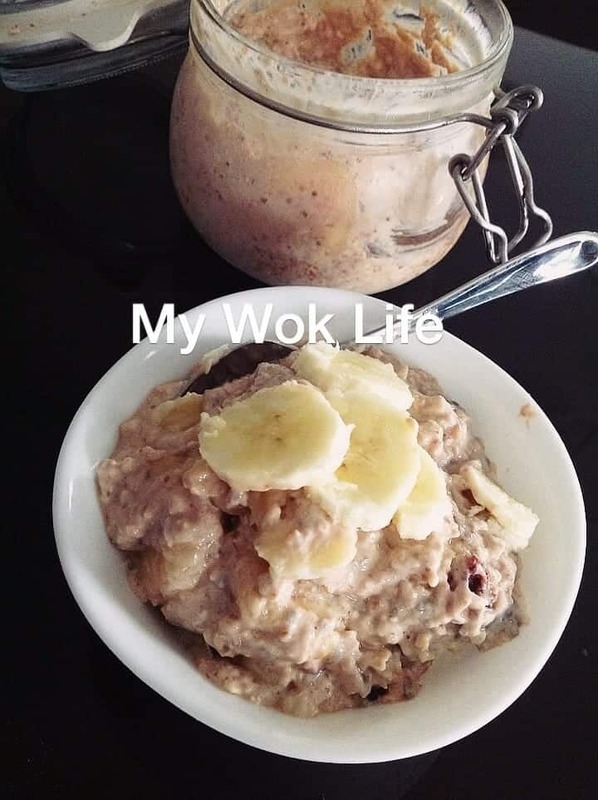 It has been in trend to make overnight oat meal for breakfast in the female community, but I have more reasons to start having it on daily basis. I needed this healthy low-fat meal to kick start my dieting plan. However, as many would agree, not many would eat oat porridge regularly. So many people, including myself, were having this impression that oat meal is for the weak or aging folks…. but but, let me tell you now, it’s not true! If you are curious why overnight? It’s because we aren’t using instant oat which can be soften straight by adding water. This recipe requires rolled oat which needed to be cooked. However, we don’t cook the oat here, but to soak in milk and store overnight to yield the soft texture. That’s the reason for overnight. Oh well, rolled oat was seemed to coarse for my palate, I used quick-cook rolled oat, a medium-sized oat between fine instant oat and whole rolled oat, as my personal preference. Ya… So far so good. Anyway, this is my version of overnight oat, after many nights of experimenting to reach the best texture and tasty flavour. Try the recipe, and you would be impressed. (1) Prepare a glass jar (about 500-600ml capacity). 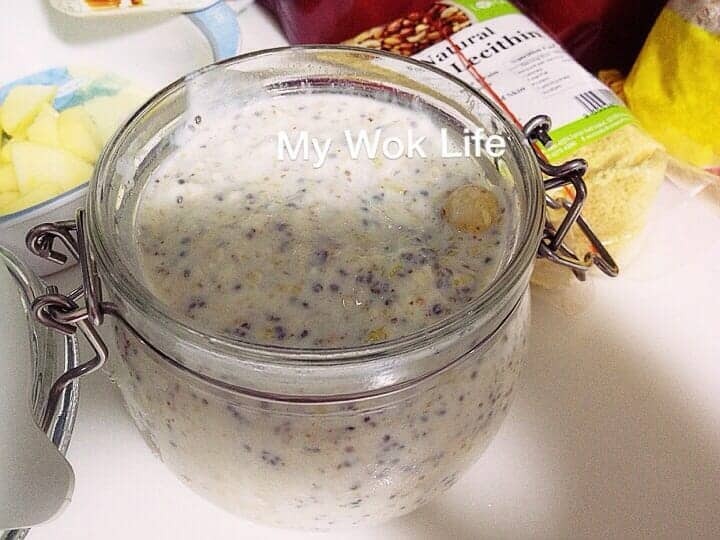 Add oat into a glass jar. Pour a portion of milk (until it covers the oat). (2) Add Chia seeds, flaxseed meal and lecithin, followed by yogurt. (4) Use a spoon to mix all ingredients until well combined. Stir gently. Cover up jar and store in refrigerator overnight. Chia seeds are rich in plant-based Omega 3 fatty acid. Flaxseed is high in fiber, Omega 3 fatty acid, B-vitamins and low carb. Soy Lecithin promotes weight loss, improves brain function, low in cholesterol, and for breastfeeding mums, it helps in prevent block duct. P/S: It does increase my yield for eating this oat meal, indeed. But again, I shall say it’s all depends on individual body, too. I also did feel fuller for longer time with this food, and hence, reduced my hunger pang (aka cut down on food intake!). A portion of the overnight oat meal counts less than 300kcal. 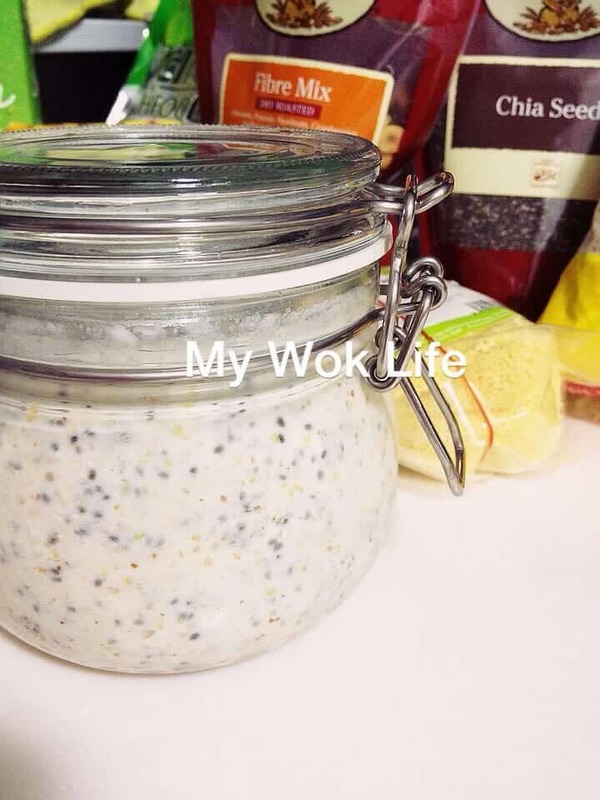 Tips: I preferred to use: quick oat, Greek yogurt with honey, Milo powder. * Top with more fresh fruits when serve. * These two flavors are my favorite, so far, but fruit toppings are exchangeable to your choice. Try blueberries, avocado, mango and etc. * Amount of each ingredient is always adjustable, depending on your preference. If you like it more viscous consistency, reduce milk. If you like it more watery, use plain yogurt instead of Greek. If you like it more gel-like consistency, add more Chia seeds. * All ingredients are available in Cold Storage supermarket. ** Storage of overnight oat: 2-4 days. ← FoodPanda allows me to bring home a restaurant! When I prepare the porridge, it is watery and tasteless. Is it like that? Will the flavour come out tomorrow and become thicken after the oats have absorbed the milk n yogurt? I mixed in the nuts but not the fruits. Correct? Hi, if it is too watery for your liking, reduce the milk. Adjust the amount to the consistency you like. Yes, it is not very tasteful, except for some yogurt taste. So, the main taste will come from the fruits and nuts, unless you add some honey in. You have to mix the fruits in also. Did u cook the oats??? Or just follow the steps n add the ingredients, keeping overnight and that’s it? Looks tasty! Yes, no need to cook the oats as they will soften after overnight soaking. That’s the purpose of overnight method. hey, just wondering where we can get the jar that you are using from? thanks! Hello! My name is PatriCa, 雪冰. I love food. Cooking is my passion, and it's all about sharing. I want my loved ones to enjoy healthy home-cooked meals. So, that includes you! 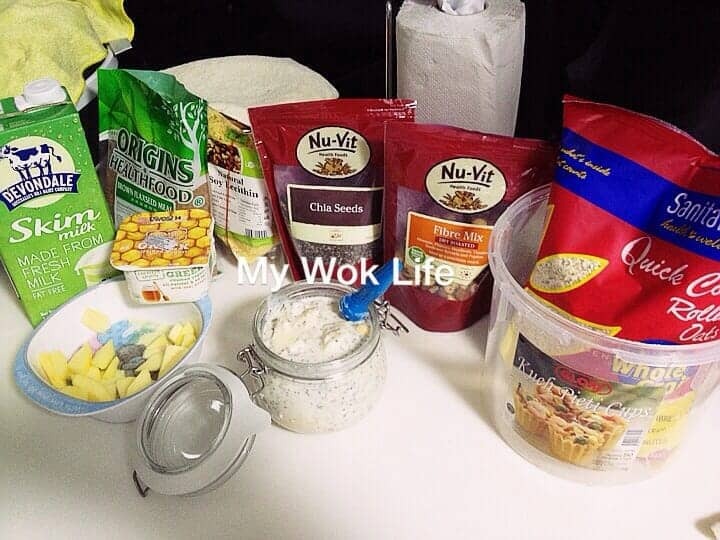 Come join me on MyWokLife FB Page, Instagram and Twitter. 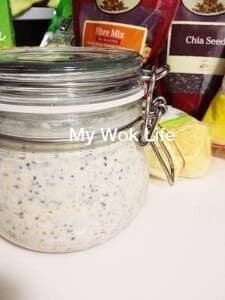 Or, leave me your comments, PM or contact me at mywoklife@gmail.com. Sharing is caring~ Appreciate your kindness to credit or link back if you do use my recipes for any purpose. This web site was built on the lovely themes from Rescue Themes. All Rights Reserved.